US, 1952, 96 minutes, Black and white. Alan Young, Jean Simmons, Robert Newton, Victor Mature, Maurice Evans, Reginald Gardiner, Elsa Lanchester, Alan Mowbray, Gene Lockhart. 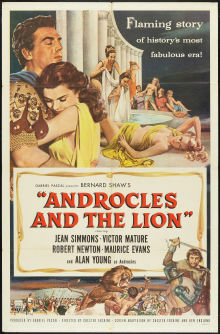 Androcles and the Lion is based on the play by George Bernard Shaw (who appears in profile on a plinth during the credits of the film). The film was produced by Gabriel Pascal, to whom Shaw had given the rights for the film productions of his plays. Pascal's successes (which he directed) include Pygmalion, Major Barbara and the lavish Caesar and Cleopatra. However, for this film, direction is by American Chester Erskine who co-wrote the screenplay. Erskine directed such popular films as The Egg and I. Critics have called the film misguided. They are not entirely wrong. While the film looks like a Roman spectacle (despite very stagey sets), it is a very modern style comedy - in George Bernard Shaw's style. Whether the two mesh together depends on the tolerance of the audience. So, while the film looks like an ancient spectacle, it sounds particularly modern, with the mixture of English and American accents. Some of the dialogue seems particularly flip. There are also modern references - most obviously with the Christians singing "Onward Christian Soldiers". The film's cast is quite a mixture, ranging from Jean Simmons with her beauty and dignified English presence, to strong Victor Mature (they were later to appear together in The Robe). Alan Young is a particularly ingenuous Androcles (and was later, of course, to star in Mr Ed). Robert Newton is there in a rather eye-rolling parody of himself as the strong Christian. Maurice Evans is the effete emperor. Of interest as a film version of Shaw's story as well as giving something of Shaw's attitude towards Christianity, martyrdom, religious values and faith. 1. Interesting version of George Bernard Shaw's play? Fidelity to the play? Adaptation to the screen? 2. Black and white photography, the stagey sets? The atmosphere of the Roman Empire, of Rome and the Coliseum? Musical score? 3. The title, the focus on Androcles, his love of animals, kindness to the lion - and the repercussions in the Coliseum? 4. The portrait of Androcles: at home, his shrewish wife, the animals? The arrest? Her determining to go with him? Lost on the way - and his sympathy for her next husband? Androcles as a tailor, as a Christian? Ingenuous and simple? On the road, the encounter with the lion, taking the thorn from its paw? Calling him Tommy? The meeting with the other Christians, friendship with Lavinia? On the road, singing the hymns? The Roman officials? In Rome, in prison, with Ferovius? The encounters on the way, his intervening with the Roman aristocrat when he hit Ferovius on the cheek? Friendship with Lavinia, the prospect of freedom and the emperor deciding he should die? Going into the arena, encountering Tommy, waltzing in the Coliseum with him, threatening the emperor, the emperor's change of heart? His pride as a tailor and as a Christian? Shaw's attitude towards Christian faith, simplicity, martyrdom, life after death, life on Earth? 5. Lavinia, her background, as a Christian going to martyrdom, her faith, her flirting with the Captain, his response? Her calming of Ferovius? In prison, going to death, urging Androcles to offer the incense, wanting to go in his place? The happy finale with the Captain? Her speeches about faith, commitment, martyrdom and their effect on the Captain? Shaw's viewpoint on faith through her speeches? 6. Ferovius, the strong man, converting people by force, his fights, his mania, his prayer? Lifting the carriage to release the crushed man? His confrontation with the Roman aristocrat and trying to help him to be a Christian? The build-up to the fights in the Coliseum, his killing his opponents? His shame? His entering the Praetorian Guard? His Christian values? 7. The emperor, his personal style, his court? Intrigues, the games? His self-importance, divinity? His attitude towards Christianity, spreading it by creating martyrs? The games, his confrontation with the Christians, Ferovius's success, sending Androcles to the lions, the lion and its chasing him, Androcles helping him, seeming to conquer the lion? Poking fun at the emperor and the empire? His courtiers and their intrigues? The foppish aristocrat who confronted Ferovius on the street and was then in fear of his life? The organiser of the games? The lionkeeper and his demanding a Christian to be thrown to the lions for the sake of the public? The ugliness of the public and their delight in the lions consuming the Christians? 8. The Captain, his duty, the officer in charge and letting the Christians sing "Onward Christian Soldiers" and other hymns? His attraction towards Lavinia, listening to her speeches, wanting to convert her, her wanting to convert him? The happy ending? 9. How well did the film blend the ancient style with George Bernard Shaw's contemporary comic style and language? Shaw's understanding of Christianity - for and against?